An intertwined drama about the United States' war on drugs, seen through the eyes of a once conservative judge, now newly-appointed drug czar, his heroin-addicted daughter, two DEA agents, a jailed drug kingpin's wife, and a Mexican cop who begins to question his boss's motives. Javier Rodriguez: [in Spanish] Last night I had an ugly nightmare. Manolo Sanchez: [in Spanish] Oh yeah? What happened, man? Q: Who was Arnie Metzger? Q: What is it that Gordon attatches to the table in the Ayala's house towards the end of the film? Q: What was the deal Helena made with Juan Óbregon? All you could ask for. No compromises here. 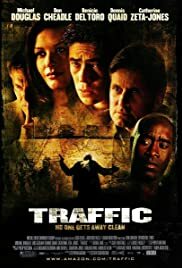 Traffic takes a long, hard look at the narcotics industry in North America and manages to entertain at the same time. The triple plot allows you to see the whole industry with multiple perspectives. The movie is visually stunning, loved the different filters for the three locations. That the war on drugs cannot be won, and is hypocritical to boot, is a message that needs as much air-time as it can get. 110 of 146 people found this review helpful. Was this review helpful to you?